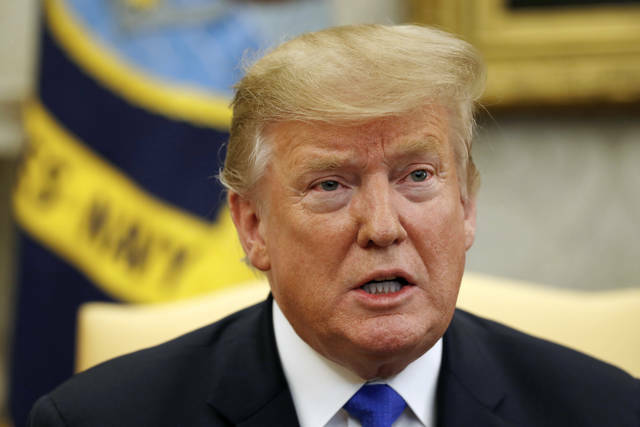 WASHINGTON (AP) — The federal budget deficit is ballooning on President Donald Trump’s watch and few in Washington seem to care. And even if they did, the political dynamics that enabled bipartisan deficit-cutting deals decades ago has disappeared, replaced by bitter partisanship and chronic dysfunction. That’s the reality that will greet Trump’s latest budget , which will promptly be shelved after landing with a thud on Monday. Like previous spending blueprints, Trump’s plan for the 2020 budget year will propose cuts to many domestic programs favored by lawmakers in both parties but leave alone politically popular retirement programs such as Medicare and Social Security. Washington probably will devote months to wrestling over erasing the last remnants of a failed 2011 budget deal that would otherwise cut core Pentagon operations by $71 billion and domestic agencies and foreign aid by $55 billion. Top lawmakers are pushing for a reprise of three prior deals to use spending cuts or new revenues and prop up additional spending rather than defray deficits that are again approaching $1 trillion. It’s put deficit hawks in a gloomy mood. Trump’s budget arrives as the latest Treasury Department figures show a 77 percent spike in the deficit over the first four months of the budget year, driven by falling revenues and steady growth in spending. Trump’s 2017 tax cut bears much of the blame, along with sharp increases in spending for both the Pentagon and domestic agencies and the growing federal retirement costs of the baby boom generation. Promises that the tax cut would stir so much economic growth that it would mostly pay for itself have been proved woefully wrong. Trump’s upcoming budget, however, won’t address any of the main factors behind the growing, intractable deficits that have driven the U.S. debt above $22 trillion. Its most striking proposed cuts — to domestic agency operations — were rejected when tea party Republicans controlled the House, and they face equally grim prospects now that Democrats are in the majority. Trump has given no indication he’s much interested in the deficit and he’s rejected any idea of curbing Medicare or Social Security, the massive federal retirement programs whose imbalances are the chief deficit drivers. Democrats have witnessed the retirement of a generation of lawmakers who came up in the 1980s and 1990s and negotiated deficit-cutting deals in 1990 and 1993. But those agreements came at significant political cost to both President George H.W. Bush, who lost re-election, and President Bill Clinton, whose party lost control of Congress in 1995. But the moderate wing of the Democratic Party has withered with the electoral wipeout of “Blue Dog” Democrats at the hands of tea party forces over recent election cycles. While in charge of the House, Republicans used to generate nonbinding budget blueprints that promised to balance the federal ledger by relying on a controversial plan to eventually transform Medicare into a voucher-like program. But they never pursued follow-up legislation that would actually do it. Republicans, who seized Congress more than two decades ago promising and ultimately achieving balanced budgets during the Clinton administration, have instead focused on two major rounds of tax cuts during the Trump era and the administration of President George W. Bush in 2001. Nor are Republicans willing to consider tough deficit-cutting steps such as higher taxes or Pentagon budget cuts. Leading Democratic presidential contenders talk of “Medicare for All” and increasing Social Security benefits instead of curbing them. Trump has never gone to the mat for his plan to slash domestic spending such as renewable energy programs. Neither is there any reservoir of the political will and bipartisan trust required to take the political heat for the tough steps it would take to rein in deficits. And it’s not like voters are clamoring for action. The deficit registered $714 billion during Trump’s first year in office but is projected to hit about $900 billion this year, according to the Congressional Budget Office, which says Trump’s tax cut will add $1.5 trillion to the deficit over 10 years. “One of the short-term goals should be — I know it’s not a lofty goal — stopping things from getting a lot worse. It’s something the Republicans obviously were unable to do. That’s a low bar, but they couldn’t meet a low bar,” said Sen. Chris Van Hollen, D-Md. Albert Einstein supposedly said that a true sign of madness was to keep repeating the same experiment but to expect a different result. By this definition, the Trump administration’s trade policy should be deemed insane. In its effort to reduce the country’s trade deficit, the administration has kept relying on increased import tariffs and renegotiating trade deals to do the job. It has done so even though since the start of the administration the trade deficit has kept rising despite an American First trade policy. Over the last two years, the administration has engaged in at least three rounds of trade protection. It started by imposing tariffs on many types of aluminum and steel imports. This was followed by substantial pressure on Canada and Mexico to agree to modification in NAFTA to the U.S. advantage. More important has been the imposition of a 10 percent tariff on $250 billion of Chinese imports. This has been coupled with the threat to both widen the scope and increase the level of these tariffs should China fail to commit itself to modify its predatory trade practices. If the primary objective of Trump’s America First trade policy has been to reduce the trade deficit, to date it has to be judged a dismal failure. According to the Commerce Department, during 2018 the U.S. trade deficit will have widened to around $900 billion, or the largest such deficit in more than 10 years. Meanwhile, the U.S. bilateral trade balance with China has now risen to the highest level on record. Undaunted by the seeming ineffectiveness of trade protection to reduce the U.S. trade deficit, the administration is now giving serious consideration to imposing a 25 percent tariff on European and Japanese automobiles. Paving the way for such tariffs has been the recent determination by the Commerce Department under Section 232 of the Trade Expansion Act that automobile imports constitute a national security threat. That determination gives President Trump 90 days within which to decide whether or not to impose automobile import tariffs. Imposing tariffs would be eagerly welcomed by our automobile industry whose international competitiveness has been eroded by the increased cost associated with the administration’s aluminum and steel import tariffs. In doggedly pursuing trade protection as the indicated route to reduce our trade deficit, the administration is blinding itself to one of macroeconomic theory’s few basic truths. That theory teaches that purely as a matter of arithmetic a country’s trade balance is determined by the degree to which its savings level falls short of its investment level. It follows from this truth that if a country wishes to reduce its trade imbalance there are two basic ways that it can achieve that result. It either must increase its savings rate or it must reduce the rate at which it invests. Viewed through the Savings-Investment lens, it should have come as no surprise that the U.S. trade deficit would keep rising despite the application of an America First trade policy. By engaging in a large unfunded tax cut and going along with public spending increases, the administration has put us on the path of substantially increased budget deficits and reduced public sector savings levels. In so doing it has raised the specter of the “twin deficit” problem of the 1980s when the country suffered from both a trade and a budget deficit. The U.S. Treasury has correctly identified Germany rather than China as the country with the world’s largest external surplus. At a time that the German economy is already on the cusp of a recession, there is the real risk that a 25 percent tariff on its automobile exports would tip that economy well into recession. That would almost certainly further increase rather than reduce Germany’s external surplus as its investment rate and its import demand would decline with its economy. If the administration were serious about wanting to reduce our trade deficit, it would concentrate its efforts on exercising a greater degree of budget discipline. That might reduce our rate of public sector dissaving and help improve our savings-investment imbalance. At the same time, it might use whatever leverage it had over a country like Germany to compel it to use the fiscal space that it now enjoys to stimulate its moribund economy and to reduce its trade surplus. Maybe then we might hope that the world’s external imbalances might be addressed in the context of a healthy global economy and without the risk of triggering a world trade war. Sadly, there is little indication that the Trump administration is moving in that direction. Disclosure statement: Jimmie Lenz has received funding from Manhattan Institute. Partners: University of South Carolina provides funding as a member of The Conversation US. New findings from the New York Federal Reserve reveal that millennials have now racked up over US$1 trillion of debt. This troubling amount of debt, an increase of over 22 percent in just five years, is more than any other generation in history. This situation may leave you wondering how millennials ended up in such a sorry state. As important as the debt is how millennials’ economic choices vary from the expectations. Millennials are much more conservative than the debt balances may indicate. In fact, in comparison to previous generations this group is significantly more fiscally conservative. U.S. millennials – Americans born between 1981 and 1996 – have experienced the cosmic duality of yin and yang like few other generations. Millions across all generations have yet to fully recover from the global financial crisis, but displays of extreme wealth are more visible than ever, thanks to social media. Millennials benefit from dramatic advances in health care, while living through an opioid epidemic that is now a major cause of death in the U.S. They have witnessed and contributed to monumental technological advances. At the same time, they must reconcile the ethical and financial implications of 29 years of global military actions frequently led by the U.S.
Do these experiences affect the behaviors of millennials? It seems that it has led millennials to be more conservative with their money, as is well documented in studies of this group. While the debt levels accumulated by millennials eclipse those of the previous generation, Generation X, at a similar point in time, the complexion of the debt is very different. According to a 2018 report from the St. Louis Federal Reserve Bank, mortgage debt is about 15 percent lower for millennials and credit card debt among millennials was about two-thirds that of Gen X. However, student loan debt was over 300 percent greater. Student debt affects a much broader age segment than just millennials, at over 43 million borrowers, but the burden weighs most heavily on this generation. Given the behavior of previous generations, it seems that this lower credit card debt and mortgage debt reflect millennials’ more risk-averse approach to their finances. Another marked behavioral difference between generations is the higher levels of retirement savings among millennials than any previous generation at the same age. While Gen Xers had acquired about $13,600 at around the same point in time, millennials have saved $15,500 in retirement accounts on average. Millennials are also more committed to higher education. Between 2001 and 2016, the number of people aged 25 to 29 with at least a four year degree grew by 25 percent. Both increased retirement savings and additional education are behaviors that economists might consider conservative investment strategies, more so when paired with lower credit card debt. But these changes in attitudes or perspectives can be difficult to measure. Another significant departure in this generation’s spending behavior is that millennials are delaying when they enter the housing market as homeowners and take on the associated debt of owning a home. Statistics from the U.S. Census Bureau and the American Community Survey illustrate this stark difference in homeownership. The number of millennials who own houses lags previous generations by about 8 percentage points. Student debt was cited by the Federal Reserve in its January 2019 Consumer and Community Context report as a factor in millennials delaying homeownership. However, given millennials’ propensity to contribute more to their retirement savings accounts, it’s not certain that student loan debt alone is what is keeping them out of the housing market. For example, in recent years, the trend toward urbanization has resulted in an increase in urban housing prices. This is particularly evident in counties where more young people live or are moving to. These rising housing prices nearest employment centers may partly explain why millennials have delayed entering the housing market. Perhaps a different perspective of success is required when assessing the millennial generation, a perspective that emphasizes more than the acquisition of homes and other hard assets, which is based on the relative perspective of an older generation’s measures of the American Dream. After all, previous generations have led millennials down a path of global economic uncertainties and real estate booms and busts. Millennials are now showing their reluctance to commit to such long-term debt, given the times they have lived through and the true economic return on homes. Homes return little more than the rate of inflation, and when taxes, insurance and maintenance are factored in they look even less attractive. The net result of these behavioral changes, paired with the economics of the environment, is that millennials’ average net worth is about $90,000, compared to Gen X of $130,000 at a similar age point. But I contend that net worth isn’t the whole story. Millennials have emphasized post-secondary education, resulting in less time in the work force than their Gen X counterparts. Given this choice of education over employment, the net worth figures are quite logical. Although one might profess that in a few years these millennials will “catch up” and enter this phase of homeowner indebtedness, perhaps their approach on life deemphasizes the acquisition of things. While long-term student debt has reduced millennials’ ability to gather assets at the same rate as previous generations, many of this generation seem to have adopted an alternative view on assets, preferring the acquisition of experiences and savings accounts over things. Studies show that experiences lead to longer-term happiness and may provide another perspective on which to gauge the fiscal state of millennials. We have a once-in-a-generation opportunity to protect our democracy — and our planet. For decades, majorities of Americans have favored swift, meaningful action on climate change. They understand that we must transition away from dirty fuels and toward clean, renewable energy. Yet despite this overwhelming support, Congress has repeatedly failed to act. This jarring disconnect between what the public wants to see and what Washington is prepared to deliver doesn’t just threaten the health and safety of everyone in our country — it undermines the very principle of representative democracy. The reason that Congress hasn’t acted is an open secret. Follow the trail of the millions of dollars in campaign contributions from corporate polluters over the years, and you’ll find countless lawmakers who’ve worked to block action on climate change. The special interests that are hostile to our environment have designed a sophisticated toolkit for furthering their narrow agenda, while avoiding accountability. This assault on our democracy must end. That’s why the new House majority passed H.R. 1, the For the People Act — a bold suite of reforms that will transform our government and our political system for the better. Every provision of the bill is guided by one overarching imperative: restore the power and the voice of Americans who for too long have felt locked out of their own democracy. First, H.R. 1 will push back hard against the influence of big money in our politics. That means bringing more transparency to the world of campaign finance so that polluters can no longer use shadowy organizations to hide their political spending. In addition, by building a new system of citizen-owned elections that amplifies the power of small donors, H.R. 1 will reduce the financial influence of PACs and big corporations. The result will be environmental policy made for the public interest, not the interests of the fossil fuel industry. Second, H.R. 1 will make sure that public officials serve the public, not themselves or some hidden group of industry patrons. The bill extends conflict of interest rules to presidents and vice presidents and requires the release of their tax returns. It will prohibit members of Congress from serving on corporate boards and establish a code of ethics for the justices of the Supreme Court. And it will end the practice of corporations giving giant bonuses to employees who join the regulatory agencies overseeing them. Third, H.R. 1 will protect every citizen’s right to vote and tear down barriers to the ballot box. That will help Americans send lawmakers to Washington who will act on climate, protect our environment, and make our air safe to breathe and our water safe to drink. That means promoting national automatic voter registration, expanding early and absentee voting, ending voter roll purging, and providing relief from discriminatory voter ID laws. H.R. 1 also ensures the integrity of our elections by committing Congress to build a record of voter suppression that demonstrates the need to restore the Voting Rights Act, ending partisan gerrymandering, and safeguarding our election infrastructure from interference. With H.R. 1, we have a once-in-a-generation opportunity to clean up Washington, make our democratic process more fair and inclusive, and insist that Congress respond to the will of the many, not the money. Doing so will remove long standing barriers that have slowed and blunted climate action. Michael Brune serves as executive director of the Sierra Club. Rep. John Sarbanes (D-MD) authored H.R. 1. Distributed by OtherWords.org.